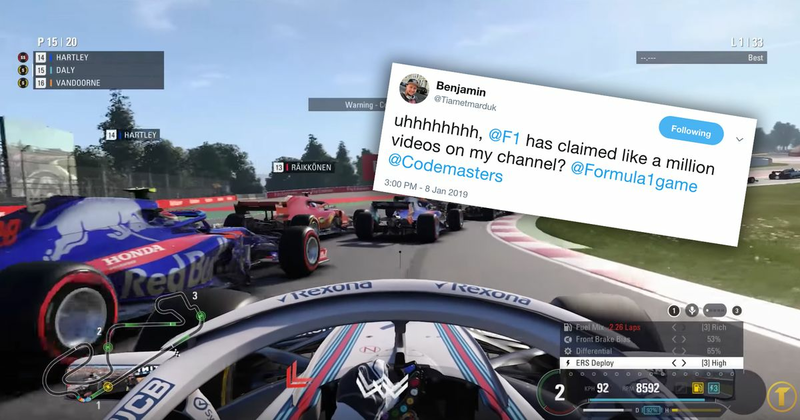 Numerous big names in the community, such as Tiametmarduk, Jimmy Broadbent and even WTF1’s own xMattyG have taken to Twitter to voice their concerns over seeing swathes of videos claimed for copyright infringements by Formula 1. Series developers Codemasters have stated that they are aware of the situation and are currently investigating the matter. There are even reports that content creators that feature other titles, such as Polyphony Digital’s Gran Turismo Sport and Kunos Simulazioni’s Assetto Corsa, have had their videos subject to review and subsequently hit with a copyright claim. Just had 20 of my F1 career mode videos copyright claimed by @F1 on gameplay footage. Can I get any help with this @Formula1game? YouTube’s notoriously shaky Content ID algorithm allows copyright holders to block a video that features supposedly unauthorised content, demonetise the video - or share the earnings with the uploader - or simply have access to the video’s statistics. Repeat transgressions of the copyright laws could see the offender’s channel terminated. Aside from the inconvenience of having tens, if not hundreds, of videos claimed, the issue could stand to hit the pockets of content creators should advertisements be prohibited on the content in question. With YouTube’s monetisation standards becoming more and more stringent by the hour, any lost disputes may see the F1 gaming community numbers fall. For now, the specifics are unknown. Some suggest that the official Formula 1 theme tune that features in F1 2018’s pre and post-race cinematics has been the trigger; while others have retorted by saying that videos and streams that have not featured the tune have been claimed too - some of the affected videos date back to F1 2014. What a nice way to start a new year of YouTube. Not Logan Paul disastrous, but not exactly ideal either.